Today I found out the origin of the United Kingdom’s flag design. With Britain permeating many a nation’s history, even people who have never visited the place are familiar with the British flag peering out at them from their history textbooks. Red, white, and blue before America adopted the colour scheme, the current British flag has been flying above government buildings since 1801. His cross was believed to have been worn as part of English soldiers’ uniforms during the reign of Richard I, who ruled from 1189 to 1199. Certainly by the time of Edward III, who ruled from 1327-1357, the cross was used as the flag on the king’s ship and for his soldiers’ uniforms. It was Edward III who declared George the patron saint of England, probably in 1344 or 1348 (the records were destroyed by a fire). The red cross—a symbol of martyrdom—was used for the next 250 years. In 1603, when Queen Elizabeth I was dying and heirless, she declared that King James VI of Scotland would be the successor to the English throne. With England and Scotland now being unified under the same king, their flags were also combined to show that they were one nation. Scotland’s flag up until that point had been the cross of St. Andrew—a white, diagonal cross (or X shape) on a blue background, owing to St. Andrew being named the patron saint of Scotland in 1320, with St. Andrew’s cross officially being adopted as the Scottish flag in 1385. In 1606, King James I of England, IV of Scotland, created this “unifying” flag, a design that looks almost like the British flag we know today: a red cross bordered in white atop a white X-shaped cross on a blue background. King James ordered the flag to be flown on both English and Scottish ships, though ships could also fly the flag of St. George or St. Andrew alongside it, depending on where the ship was registered. The Union Flag was purely symbolic until 1707, however, when English and Scottish parliaments finally combined to form Great Britain, a new nation, with Queen Anne declaring the Union Flag as the official flag of the new country. In 1800, another change needed to be made when King George III signed an Act of Union passed by both the Irish and British parliaments, to unify Ireland and Great Britain. This became official in 1801 when the Kingdom of Ireland became the “United Kingdom of Great Britain and Ireland.” This, of course, called for a change in flag. The Irish national flag at the time was the cross of St. Patrick, the well-known patron saint of Ireland. The flag is a red X-shaped cross on a white background. Thus, the same year Ireland was incorporated, the British flag was redesigned to include the cross of St. Patrick. Despite the secession of 26 Irish counties in 1922, the cross of St. Patrick remains in the flag to commemorate the six counties of Northern Ireland that remain in the now-named United Kingdom of Great Britain and Northern Ireland. 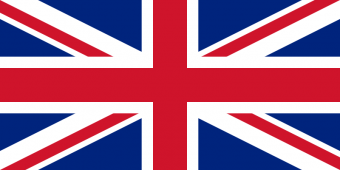 The terms British flag, Union Flag, and Union Jack are all correct terms for the flag. Some believe that “Union Jack” should only be used when describing a British flag flying above a warship, but this is a recent idea. In 1908, the Parliament declared that “the Union Jack should be regarded as the national flag” – flown anywhere at anytime. However, this maritime naming idea hints at why the British flag is called the “Union Jack”. A “jack” around the 17th century when the flag starting being called the “Union Jack” was simply a word for a maritime bow flag. Thus, the “Union flag”, flown on the bow of a ship, was called the “Union Jack”. Around this time, the flag was also called “His Majesty’s Jack” and “the King’s Jack”. St. Andrew is not only the patron saint of Scotland, but also the patron saint of Greece. The cross of St. Andrew was once silver, not white, but changed to white throughout history. An X-shaped cross is also called a “saltire”. An unofficial Scottish flag has been used where the cross of St. Andrew is placed over the cross of St. George rather than the other way around. This, of course, brings more attention to the Scottish part of the flag and puts England in the background. However, the flag was never well-used. Early designs of the flag saw St. George’s cross and St. Andrew’s cross side-by-side, but the designs were never used. Many nations include the Union Flag as part of their national flag, including Australia and New Zealand. The state of Hawaii even incorporates the Union Flag into the design of its state flag. Saint Andrew was made the patron saint of Scotland around the time the Scots were fighting a war for their independence against the English. In 1314, they won a significant victory at the Battle of Bannockburn, led by Robert the Bruce. The battle cemented their independence, and in 1320 the Pope wrote the Declaration of Arbroath, declaring Scotland independent, lifting the excommunication from Robert the Bruce, and naming St. Andrew the patron saint of Scotland “forever.” St. Andrew’s cross was officially adopted as the Scottish flag in 1385. The origins of the Irish cross are much-contested, with some believing that it was adapted from the cross of St. Andrew or St. George—either changing the colours of the Scottish flag or rotating the cross on the English flag. In 1612, the cross can be seen on the seal of Trinity College of Dublin. In 1653, the King’s Own Regiment of Ireland used a flag with a red diagonal cross on a yellow background.